A mom of nine-year-old identical twin girls asked me to help her understand a specific dynamic that is playing out between her daughters. On the surface, the circumstances make very little sense to her. Both girls take piano lessons—Annie loves the piano and practices without being asked, but her sister, Amy, rarely practices and asks her parents about playing the trumpet. Their mom understands their differences and does not make a big deal about their divergent likes and dislikes. What she can’t make sense of is why Amy gets angry when Annie practices the piano simply because she enjoys the activity. The same thing happens with bike riding. Annie likes to ride her bike, and Amy is less than enthusiastic. Nonetheless, Amy gets grumpy and annoyed when Annie rides her bike outside, even though Amy has little desire to do the same. I believe you have to be an identical twin girl to make sense of this behavior. By drawing on my own experience, I can speculate about what might be happening. While twins covet personal recognition, their differences may also make them feel uncomfortable or wrong. The notion that her sister may like something different than she does can make a twin feel angry and insecure because this palpable divergence can engender anxiety. While Amy does not like the piano, the fact that Annie loves to play may upset her because it highlights a real difference between the two of them. Amy is not just jealous of Annie’s affinity for the piano; she’s likely also annoyed because this difference between them makes Amy feel that something may be wrong with her not liking the piano or bike riding. Since the twins have very contrasting feelings, Amy resents Annie for making her feel as if her inherent likes and dislikes are wrong or bad. The issue is not about feeling physically abandoned by her twin, as one might assume. Rather, the issue is the complicated emotional twin dynamic that makes her think that if she doesn’t like what her sister likes, something may be wrong with her ability to trust her decision-making capabilities. In other words, can she trust herself to figure out how she feels without being influenced by her twin’s feelings? Although this reasoning may seem convoluted or distorted, I repeatedly see this unhealthy dynamic played out in adult twins who are inextricably enmeshed. Since they have spent their lives making joint decisions about pretty much everything, they are paralyzed and trapped in their twinship. They have never had the opportunity to recognize and appreciate their differences and move toward individuation. After being enmeshed for so long, their differences threaten their connection and undermine their trust in and loyalty to one another. I praised Amy and Annie’s mother for noticing this subtle dynamic and bringing it to my attention for further scrutiny. I told her how much it benefits twins to learn from a very young age that their differences help to define them. Again, this is a developmental process that needs to begin early. The adult twins that I see in my practice have not been able to embrace this developmental challenge. Unfortunately, trying to make differentiation happen all at once is unrealistic. 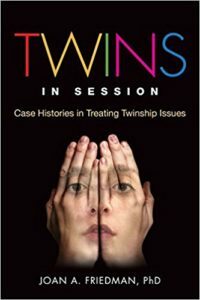 After years of being too enmeshed and denying their own needs, twin pairs in this predicament have to work out many issues to become psychologically separate. 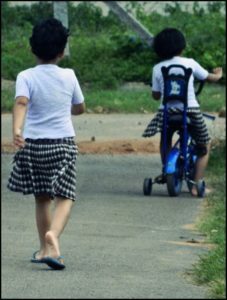 Maintaining a healthy twin connection requires keen parental attention to helping each twin own her individuality. In the long run, attunement to and support for individuation promotes a trusting, healthy twin bond.